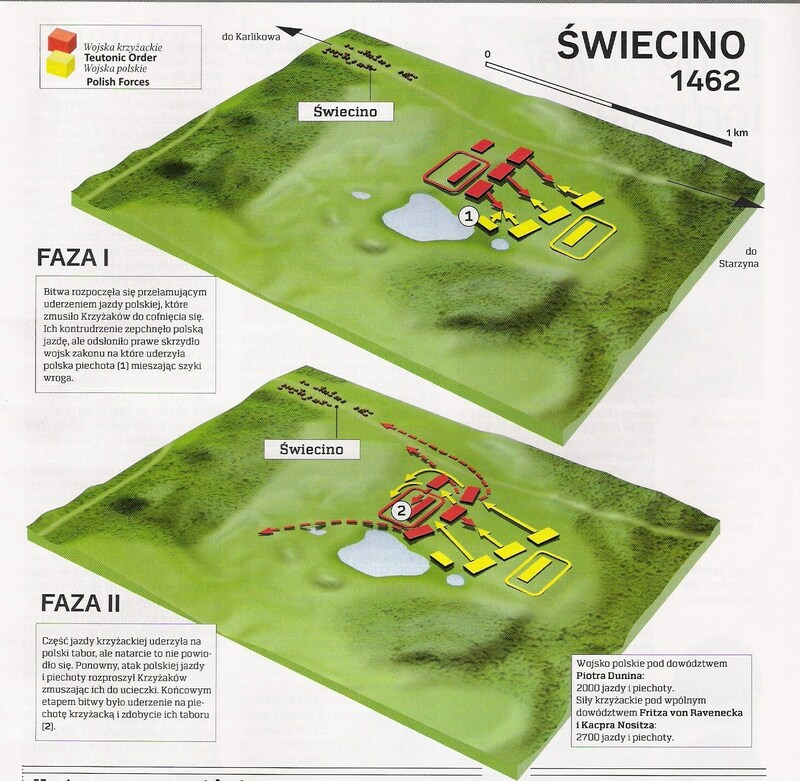 The Battle of Świecino (named for the village of Świecino, near Żarnowiec Lake, northern Poland) also called the Battle of Żarnowiec or in German Battle of Schwetz, took place on September 17, 1462 during the Thirteen Years’ War. The Poles commanded by Piotr Dunin, consisting of some 2000 mercenares and Poles, decisively defeated the 3300 man army of the Teutonic Knights commanded by Fritz Raweneck and Kaspar Nostyc. Auxiliary forces sent by duke Eric II of Pomerania, an ally of the Polish king, did not enter the battle. The Teutonic Order’s armies in terms of troop types, on this occasion the army was comprised of 1,000 heavy cavalry, 600 light cavalry, 1,300 militia and 400 other infantry. The battle started in the evening. Adopting a relatively new tactic, Polish units built a fortified camp on the Hussite model consisting of wagons linked by a chain surrounded by a deep ditch (tabor). 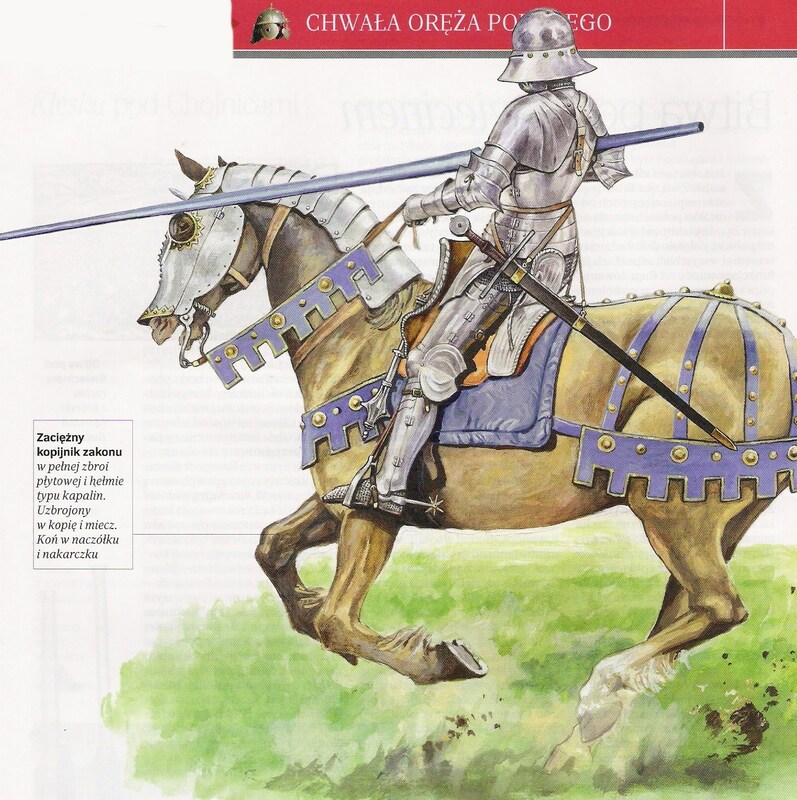 The units of Raveneck and his subordinate, Kaspar Nostyc (commander from Conitz (Chojnice) also created a tabor. Piotr Dunin decided not to wait for the enemy and attacked first, setting infantry with crossbows on the left, defended by cavalry between the tabor and the coast of the nearby lake of Rogoźnica. Raveneck placed cavalry in front of his tabor, and infantry behind it, without any strategic plan. The first phase of the battle was started by a charge of Polish heavy cavalry under Paweł Jasieński. Fierce fighting continued for three hours and ended without a clear winner. After a short pause at midday, Teutonic units were able to push the Poles back; however, they found themselves under very heavy fire from crossbows of the Polish infantry, which caused huge losses and a withdrawal. During this fight Raveneck was wounded. He stopped his soldiers and tried to attack again, but this charge ended with a total defeat – Raveneck died and the rest of the cavalry surrendered or escaped. The Teutonic infantry tried to defend themselves at the tabor but its resistance was broken by a quick attack of Polish cavalry. The Teutonic Order’s army lost around 1000 soldiers, including some 300 cavalrymen. Fifty soldiers were captured. The Teutonic commander was also killed in battle and was buried in the Żarnowiec chapter church. The leading cities of Prussia (Danzig, Elblag, Torun, Elbing, and Thorn), later joined by 16 other towns, and the Junkers formed the Preussische Bund (‘‘Prussian Confederation’’) in 1440. In 1452 the Bund appealed to Emperor Friedrich III to mediate their grievances with the Brethren. Instead, early the next year Friedrich ordered all Prussians to submit. This forced the Bund to seek help from the Poles. In early 1454, the Bund secretly asked to be incorporated into Poland. Casimir IV signaled that he would support the rebels if they made a public request: his interest was to detach Prussia from the Teutons and annex it to Poland- Lithuania. From February 6, the Bund began taking over and destroying lightly garrisoned Teutonic castles. On March 6 a formal agreement was reached between Casimir and the Bund asserting Polish sovereignty over Prussia and declaring war on the Brethren. The Knights were briefly resurgent: they defeated the Danzig militia and burned part of the city in July 1460. The fundamental weakness of the Polish recruitment system, based still on feudal levies of peasants and independently minded noble cavalry, became apparent in deep resistance to new enlistment drives. Casimir finally persuaded the nobles to turn the fight over to professionals. That meant raising funds to hire a mercenary army rather than raising peasant levies to be led by amateur noble captains. These harder and more skilled troops crossed into Prussia in 1461. 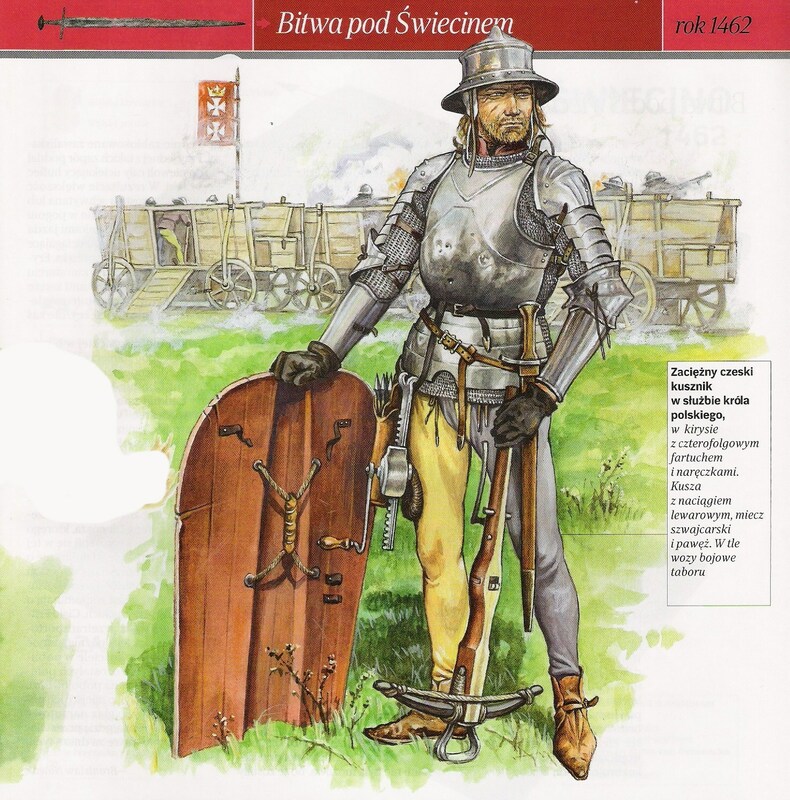 At Swiecino (August 17, 1462), the defeat they handed to the Brethren’s field army was so sharp that the end of Teuton rule in the eastern Baltic came into sight. Loss of the Brethren’s fleet at Zatoka Swieza (September 15, 1463) so severely damaged the Order’s maritime interests and profits in the eastern Baltic that the Knights could no longer pay for a war being fought mainly by privateers at sea and mercenaries on land. A complete defeat was only averted by the internal divisions of Poland-Lithuania. This entry was posted in Battle, Crusades, Poland by MSW. Bookmark the permalink.